Former Director General of Nigerian Institute of Advanced Legal Studies, Professor Epiphany Azinge has declared that the use of forces of coercion to undermine the democratic preference of voters is the worst crime against the rule of law. Speaking during a public lecture in honour of the late Attorney General and Commissioner of Justice of Rivers State, Sir Emmanuel Aguma (SAN) on Wednesday, Professor Azinge regretted that the illegal use of security agencies to undermine the constitutional governance. The Public Lecture titled: “The Rule of Law and Leadership in Nigeria’s Democracy: The Role of the Attorney General” had in attendance Rivers State Governor, Nyesom Ezenwo Wike, Former Senate President, Dr Iyorchia Ayu, Former Deputy Speaker of the House of Representatives, Rt Hon Austin Opara, Senior Advocates of Nigeria, traditional rulers and leaders of the state. Professor Azinge said: “Another brazen affront to the concept of the Rule of Law is the ignoble role of law enforcement agencies to wit, Police, state security services, the armed forces in the affairs of bastardization of democratic norms and principles. He said that good governance requires fair legal frameworks that are enforced impartially to protect the rights of all group of persons. The Legal Luminary said that the Honourable Attorney General has the responsibility of advising the Government to ensure that the rule of law is maintained and Government actions are constitutional and valid in law. 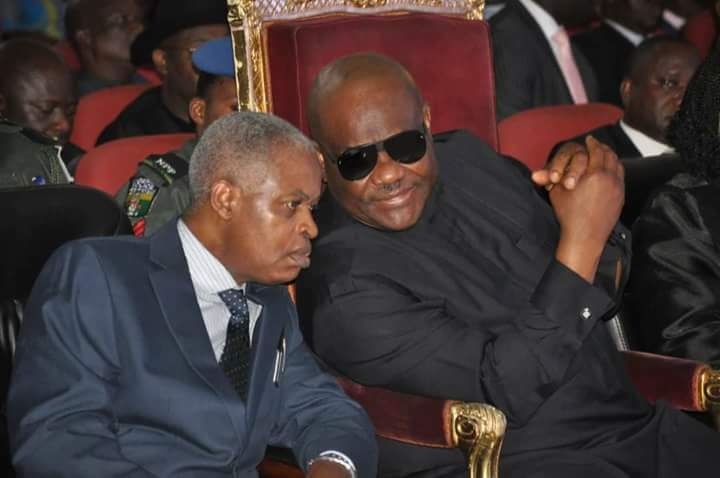 He said that the Late Attorney-General of Rivers State was one of the finest Chief Law Officers and Legal Minds of Rivers State. He said: “In Emmanuel Chinwenwo Aguma, KSC, SAN, Rivers State Government was privileged to have one of the finest legal minds as Chief Law Officer of the state. His patrician carriage, elevated thought process and commanding presence made him the toast of his peers and colleagues “. Professor Azinge added that the Late Aguma was unapologetically an apostle of the concept of the Rule of Law, saying that Rivers State benefited from his legal advice. “Emmanuel Aguma has played his part and now belongs to the pantheon of great legal icons and his legacy will live forever. He will be remembered as that Attorney-General who will dust his books and head to the court to defend the position of the Government he served”. Chairman of the occasion, Emma Ukala (SAN) said that the organisation of the Public Lecture in honour of the late Attorney General and Commissioner of Justice of Rivers State by the State Government lays credence to the very special place that he occupies in the hearts of the Governor and people of the state. He said though Aguma was young, he carved out a place for himself in the history. “We are here to immortalise the memory of Aguma. He had a brave sense of Justice. He was very courageous. But he knew decent boundaries defined by law. He worked for the survival of democratic institutions, especially the Justice “, he said. Head of Service of Rivers State, Rufus Godwins said the Late Attorney-General of Rivers State and Governor Wike shared a passion for the promotion of the rule of law.